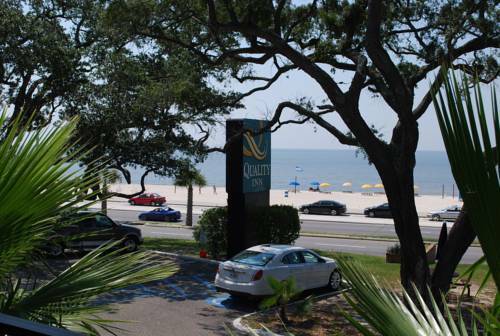 Get more for your money at the newly renovated Quality Inn Biloxi Beach hotel in Biloxi, MS located near the Mississippi Coast Coliseum and Convention Center. Nearby destinations include Gulfport-Biloxi International Airport, Keesler Air Force Base, Biloxi Lighthouse and Gulfport Little Theatre. We've just completed renovating 148 rooms with new flooring, furniture and linens. Enjoy amenities like free breakfast, free WiFi, guest laundry facilities, free coffee and an outdoor pool. Guest rooms include a flat-screen TV, microwave, refrigerator, desk and coffee maker. Also, earn rewards including free nights and gift cards with our Choice Privileges Rewards program. - Lynn Meadows Discovery Ctr. - MS Coast Coliseum/Conv. Ctr. Guided tour of a home-built Holy Land, scaled in miniature -- one yard equals one mile. A never-completed minor tourist attraction for the 1984 New Orleans World's Fair. It looks like a small-scale medieval castle. A World War II submarine up on dry land, right next to the parking lot. It's 311 ft. long, launched in 1941, serving here as a museum since 1969. A new monument helps the world remember Sylvester Magee, who claimed to the world's oldest man and last living Civil War vet and American slave.